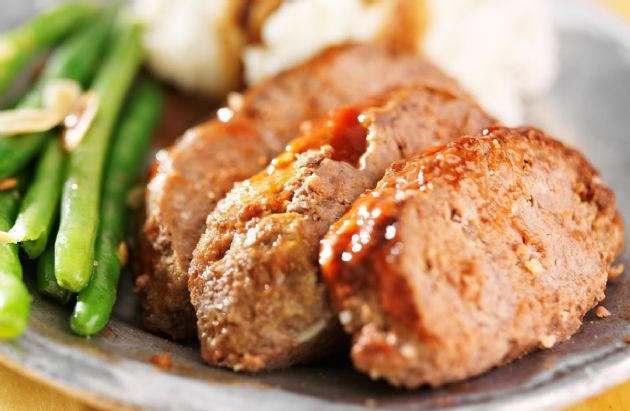 This meatloaf has the best of both worlds: a great crust and a moist interior! The trick is lining your slow cooker and creating a water bath. Trust me, it's worth the effort! The soaked bread is called a panade, and it provides moisture and adds structure to the meatloaf. You can use a leaner beef or even turkey with this recipe, if you prefer. Like it spicy? Add a pinch of red pepper flakes to the sauce and to the meatloaf. The leftovers make a great sandwich. Combine the egg, milk, mustard, and Worcestershire sauce in a large mixing bowl. Tear or chop the bread into small cubes, add to the egg mixture and soak for about 5 minutes. Add the remaining meatloaf ingredients and combine, using a fork. Coat an 8-inch round glass or metal baking dish with nonstick spray. Transfer the meat to the dish and form into a meatloaf shape. Pour 1/2 cup water into the slow cooker liner to create a water bath for the baking dish. Set on low and cover. Cook for 6-8 hours. One hour before eating, combine the sauce ingredients in a small dish. Remove the lid from the slow cooker, and carefully (using an oven mitt or dry towel) remove the baking dish holding the meatloaf. Over a large bowl, slowly tilt the meatloaf to remove the fat that has pooled in the bottom of the dish. Pour the sauce over the meatloaf. Return to the slow cooker, replace the lid and cook 1 more hour. Remove the meatloaf from the slow cooker, and cool slightly before serving. I make a 4 lb meatloaf in the large crock-pot by mixing all ingredients then put it in the sprayed crock, then I divide the meat down the middle so it will cook all the way through. I then have 2 large meatloafs - 1 for now and 1 to freeze for later. To everyone who is confused about the recipe. You need to read the instructions again.The bread is part of the recipe. It gets soaked in the eggs and then mixed into the meat.